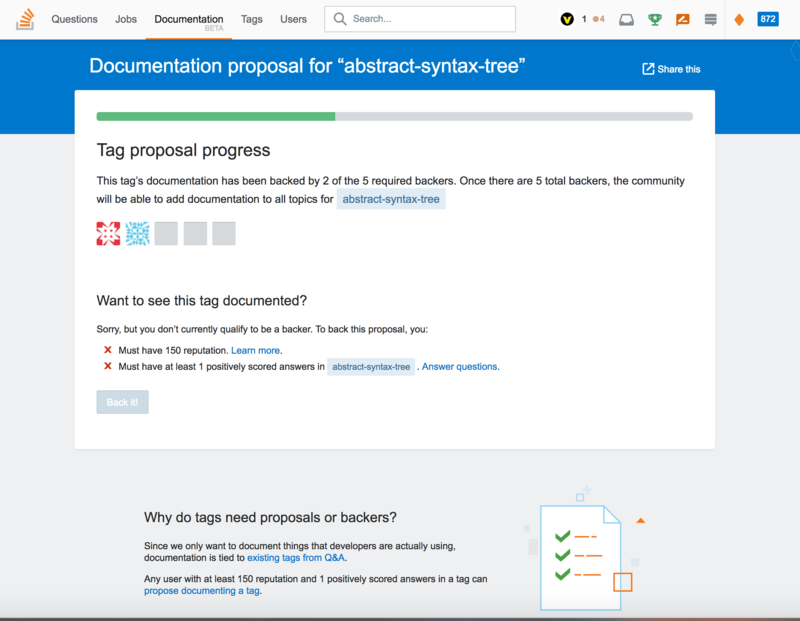 What exactly does it mean to commit to a documentation proposal? "Once there are 5 committers, the community will be able to document all (some_language_name) topics". Does it also mean that if you commit to a documentation proposal, it is also your responsibility to add and address relevant topics? How important is it to do or not to do that? What does SO recommend on who and why a person should commit to a documentation proposal? This, among many reasons is why we updated our Tag Proposal page in a recent redesign. Among other design and copy updates, we changed 'committing' to 'backing' thus better implying our original intent. ... we believe we will have an invested group backing the creation of the Doc tag. While we encourage these backers to then subsequently create and/or propose topics and engage in the tag, that's not a requirement. Also as a backer, you will be automatically signed up to receive notifications on updates to the tag - IRs, Proposed Changes, Discussion threads, Topic Requests. You can however easily adjust your preferences for these notifications - more info on that here. Not the answer you're looking for? Browse other questions tagged support documentation documentation-proposals . Why can't I commit to this documentation proposal?